Equipped with a dual core processor with each core running at 1 GHz, 10.1-inch widescreen HD display, and ultra-fast Wireless-N Wi-Fi networking, the Motorola XOOM offers more ways to have fun, connect with friends and stay productive on the go. 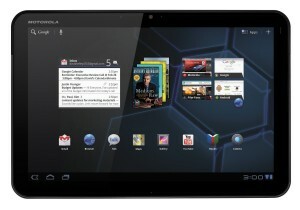 MOTOROLA XOOM features a front-facing camera, allowing you to conduct video chat with your family and friends. The rear 5-megapixel camera is designed for HD 720p video capture, ensuring you will never miss any special moment. The 10.1-inch display features 1280 x 800-pixel, delivering 10.1-inch display delivers console-like gaming performance. The Google’s Android 3.0 Honeycomb operating system delivers a multi-touch, a holographic user interface that improves on Android favorites such as widgets, multi-tasking, browsing, notifications and customization. Additionally, it also offers the latest Google Mobile innovations. Featuring a wide range of optional accessories, the Motorola XOOM expand its power and capabilities. Its “smart docks” is not only a place to charge your device, but also make Motorola XOOM a portable play and work station that fits your lifestyle. You can use the Standard Dock for watching video content or listening to music through external speakers as the device charges. You also can send HD content directly to your TV or blast your tunes without attaching external speakers thanks to the Speaker HD Dock. 1 GHz dual-core processor enables web browsing at unprecedented speed and accelerated multi-tasking. 10.1-inch multi-touch HD display (1280 x 800 pixels; 150p per inch) with 720p video capture and pinch-to-zoom navigation.